A shepherd hut conjures up a glorious Victorian picture of cosy shelter from a harsh British winter, the saviour of many a shepherd tending to his lambing flock. Suffolk Shepherd Huts are founded on this tradition but with modern comforts carefully woven in so as not to detract from the hut's rural grace and simple beauty. They strike a perfect balance with subtle skill to bring you an exquisite, wood-clad, hand-painted hut with electricity, insulation and carefully fitted double-glazed windows and door. Suffolk Shepherd Huts began in 2007, the founder inspired by the natural beauty of his Suffolk countryside homeland. John Penwarden, the current owner and manager, (seen in the picture above with "The Constable" model) joined the company in 2008 as production manager, eventually taking over the company in 2012. 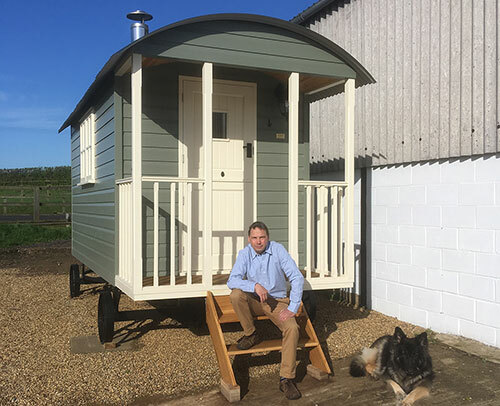 John builds his bespoke huts on his farm in the Cookley valley near Halesworth. It's his dream job as it enables him to combine his passion for woodwork and meticulous attention to detail with being at home on the farm. His business fits neatly alongside his wife's profession as a dressage rider and coach, making for an idyllic rural family lifestyle. John is rarely seen without Pippa his magnificent German Shepherd who happens to have the perfect breed name for his business! We are usually hard at work creating our next customer’s shepherd huts. For a fast response to any questions you may have please use the contact form below or email us at info@suffolkshepherdhuts.co.uk. We respond to all enquiries as quickly as we can and are happy to answer any questions you may have about our products or the way that we can tailor our shepherd huts to your personal requirements.